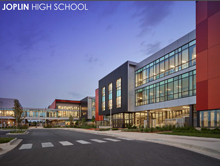 CGA wins the prestigious John Shaw Award for Joplin High School / Franklin Technology Center! The John N. Shaw Award was created in 2002, in celebration of the 40th Anniversary of John Shaw's practice of Architecture. An architectural design competition intended to showcase good design that results from collaboration with educators, students and community representatives. This award is given to one firm per year by the Association for Learning Environments. Congratulations to the team on receiving this honor!